SEOUL, South Korea, Dec. 8, 2017 /PRNewswire/ — Asia’s largest new model contest named "2018 Asian Model Festival, Face of Asia with MyGenomeBox" has launched. The "Face of Asia with MyGenomeBox" contest will be held in 27 countries in Asia such as Korea, India, China, Singapore and many others, to select four representative models for each country. The winners of each country will be competing with other Asian countries for "ASIA MODEL FESTIVAL 2018", in South Korea in May. The reason why this contest attracts the attention is that MyGenomeBox, "The world’s first Genome-based Open platform" has partnered with the Korean Model Association, to present the new "standard of beauty" and expecting "the world’s first gene-customized model". Recently "Face of Mongolia, Philippines, Korea and India with MyGenomeBox" have completed the contest with great success. 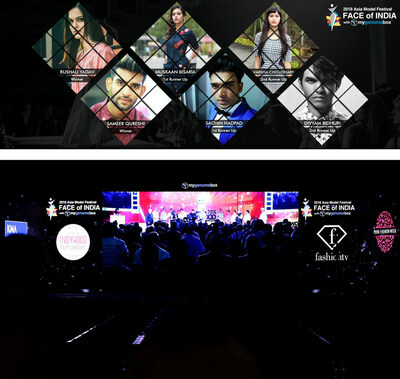 In "Face of India with MyGenomeBox", which was held last week, they associate with influence associations in the world such as "Indywood Film Carnival" and "Fashiontv". The representing models of each countries will be provided with the genetic customized solution from MyGenomeBox, such as optimized skin care, diet control and therapy, as well as mental healing program to improve self-confidence and creativeness. MyGenomeBox said "we established as a global platform possessing users from 47 countries around the worlds and our users has begun to apply their genetic information to their own lifestyle. This festival will be a great opportunity to prove that not only professional models but also anyone’s quality of life can be improved with their own genetic information,"
MyGenomeBox uses the "DNA App Store" technology, one of the "10 Innovative Technologies" selected by MIT Technology Review 2016, to allow anyone to manage or improve their lifestyle based on their own genome information. Consumers can store their genetic data in a highly secure cloud, which makes it easy for them to get access to their data and purchase DNA apps ‘anywhere’, ‘whenever’, they need it.